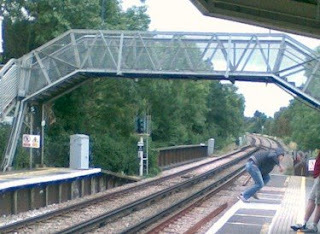 The WORCESTER PARK Blog :: Chav you seen anything as stupid? Every second counts when you're a Worcester Park chav. With so much spitting, swearing and Strongbow swilling to cram into an average non-working day you've no time to waste faffing around with silly footbridges. Need to get to the opposite platform at Worcester Park station? Simple. Just hop straight over the live rails. 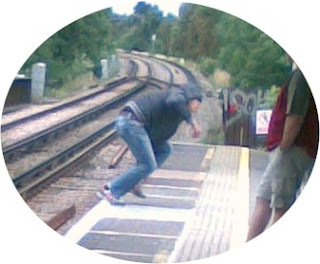 Fourtunately this not very goodie hoodie made it over the live rails in one piece - let's face it, had he fallen onto the live rail it would probably have been the first (and last) ever time that electrical activity had been recorded in his brain.